(a) Remove SST from the transfer. (b) Install the propeller with center bearing shaft assembly. 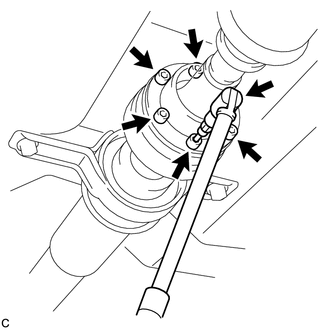 Be careful not to damage the universal joint boot when installing the propeller shaft. (c) Align the matchmarks on the rear propeller shaft and electromagnetic control coupling assembly and install the 4 nuts and 4 washers temporarily. Do not allow grease to adhere to be bolts or washers. 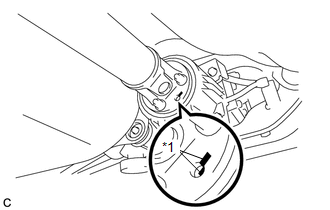 (d) Temporarily install the propeller with center bearing shaft assembly with the 4 bolts, 2 No. 1 center support bearing washers and 2 No. 2 center support bearing washers. (e) Fully tighten the 4 nuts. (a) Remove the piece of cloth or equivalent from the universal joint. (c) Using a hexagon wrench (6 mm), tighten the 6 bolts. 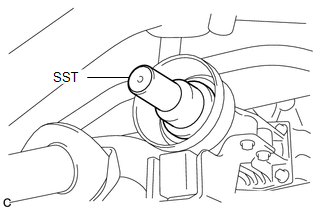 (d) With the vehicle unloaded, adjust the dimension between the rear side of the cover and shaft as shown in the illustration. 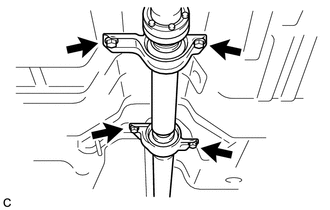 (e) With the vehicle unloaded, adjust the front and rear dimensions between the edge surface of the center support bearing and the edge surface of the cushion respectively as shown in the illustration, and then tighten the bolts. (f) Check that the center line of the bracket is at a right angle to the shaft axial direction. (g) Fully tighten the 4 bolts. 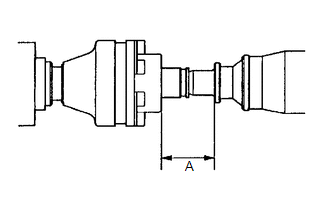 (a) If any vibration or noise occurs, perform joint angle check as follows and replace the No. 2 center support bearing washer with a proper one. (1) Turn the propeller shaft several times by hand to stabilize the center support bearings. (2) Using a jack, raise and lower the differential to stabilize the differential mounting cushion. Measure the joint angle while the vehicle is lifted using a 4 pillar lift or while working in a pit. 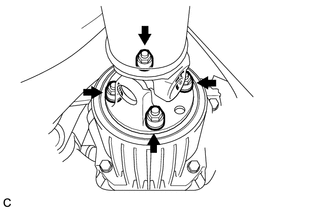 (3) Remove the transfer dynamic damper. 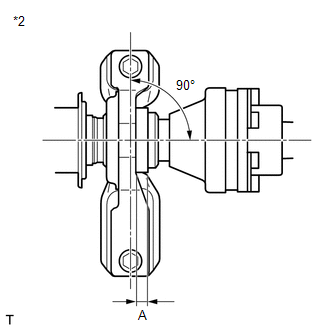 (4) Using SST, measure the propeller shaft installation angle (A) and intermediate shaft installation angle (B) as shown in the following illustration. 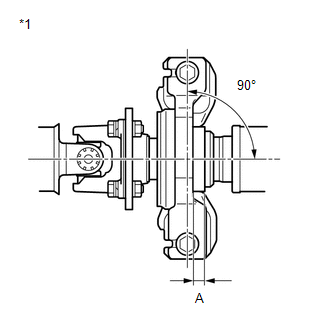 (5) Using SST, measure the rear propeller shaft installation angle (C) and rear differential installation angle (D) as shown in the preceding illustration. (6) If the calculated amount is not within the specification, adjust it with the No. 2 center support bearing washer. Make sure to use a washer of the same thickness on both right and left sides. (7) Install the transfer dynamic damper.